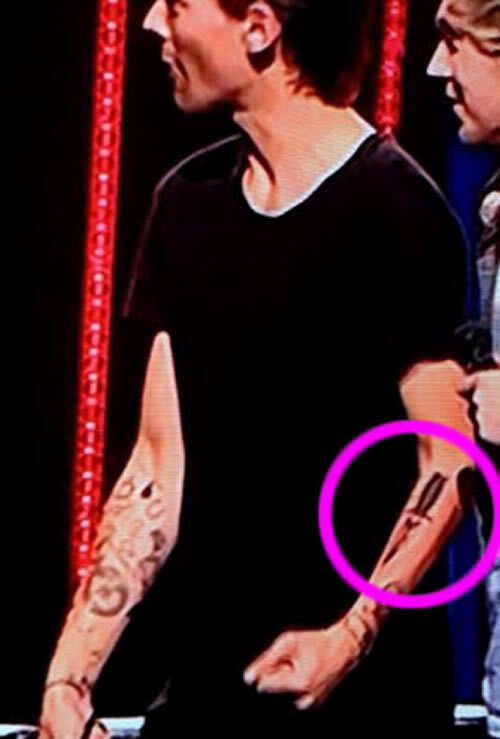 Louis Tomlinson Gets New Dagger, Quote, & Smiley Face Tattoos in Sydney! During a whirlwind trip to Australia this week, One Direction’s Louis Tomlinson got inked with a dagger tattoo on his left arm (which has many 1D fans wondering what inspired the singer to get that particular tattoo in that particular location…but more on that later), and the singer also added a quote to his left forearm and a small smiley face tattoo to his right wrist. Louis Tomlinson’s dagger tattoo is inked on the side of his left forearm, just above his skull and crossbones wrist tattoo, and features a medium-sized dagger inked in black and white. The pop star’s quote tat is located right next to his new dagger tattoo and reads “given a chance.” His smiley face tattoo is inked in black on the side of his right wrist, just below his infinity rope tattoo and next to the large swift bird tat on his forearm, and has two X’s for eyes. Okay, now for the Louis dagger tattoo drama. Louis Tomlinson certainly isn’t the first person to get a dagger tattoo inked on his body. The dagger is a popular tattoo design that can stand for a variety of things, depending on the wearer. For some people, a dagger tattoo represents strength or power, and for others, the knife is a symbol of protection, sacrifice, courage, betrayal or independence. 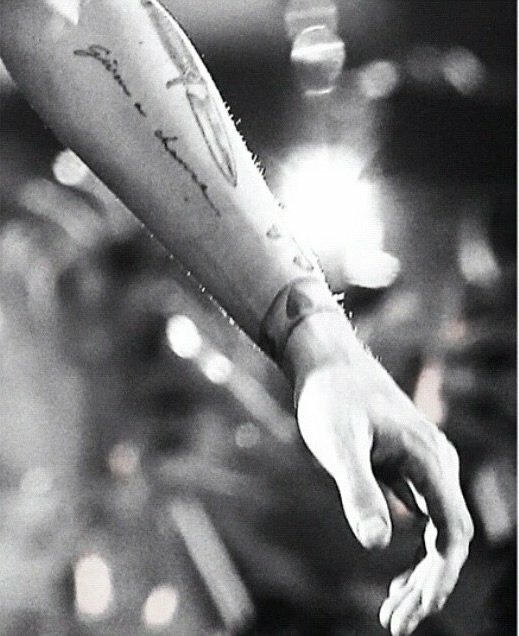 It’s not often though, that daggers are depicted on their own in a tattoo, without a skull, rose, snake, heart or another symbolic image to accompany them, and that is the reason Louis’ lonely dagger tattoo has so many tongues wagging, particularly those Larry Stylinson conspiracy theorists. Turns out, Louis Tomlinson’s dagger tattoo is inked in the exact same spot on his left forearm as Harry Styles’ rose tattoo, which could mean it’s yet another tribute to the so-called secret relationship between the two bandmates. This is, of course, due to the fact that a tattoo depicting a dagger and a rose together is a popular tattoo design that symbolizes strength, loyalty and a willingness to fight for love. Larry fanatics are so convinced that Harry and Louis are secretly in love with one another, that they actually predicted one year ago when Harry first got his rose tattoo, that Louis would follow it up with a dagger tat. And now he has. Okay, so we’ll admit that there are some strange coincidences when it comes to Louis and Harry’s matching tats, particularly the fact that among Harry Styles’ tattoos are a ship, an anchor and a heart, and among Louis Tomlinson’s tattoos are a compass for the ship, some rope for the anchor, and an arrow for the heart, all inked in similar locations on the boys. Bottom line: we aren’t quite sure if we buy into this Larry Stylinson business, but we sure are excited to see THREE new Louis Tomlinson tattoos! 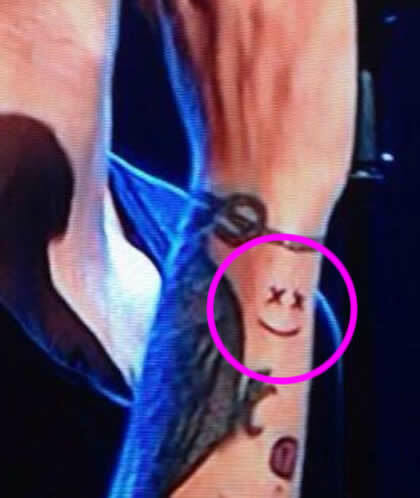 Stay tuned to find out more about Louis’ new dagger, quote and smiley face ink! 5 Responses to: Louis Tomlinson Gets New Dagger, Quote, & Smiley Face Tattoos in Sydney! It’s not only that the tattoos match, fans that are paying attention to them said that Louis would get the dagger right after Harry got the rose, and that was in September 2013. So that’s fourteen months. I mean, coincidences shmoincidences. If you look up “Louis dagger” on twitter there are thousands of people saying he’s gonna get it months, a year, before he got it. Unless we’re all psychics I can’t find another explanation. So how many “coincidental” matching tattoos until we can declare “coincidence” as redundant? Just curious.. I adore all his tattoos and Harry’a all tattoos and I love these guys. They are fabulous! But my favourite remains forever Niall James Horan. ok so the smiley with X eyes doesn’t mean anything?